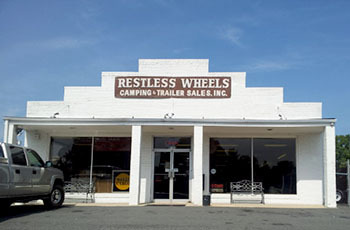 Restless Wheels only carries quality travel trailers. We also sell select pre-owned items. You will never pay dealer prep fee or DMV processing fee at Restless Wheels. While our sales representatives are here to help, you will not be followed around unless you want us there. In fact, we keep our RVs unlocked for your viewing pleasure. Here you can feel comfortable to casually and independently browse our inventory at your own pace. Featuring a full line of new and used RVs, our Restless Wheels dealership carries outstanding top quality new RVs for sale. Located in Northern Virginia, we offer top brand names like Forest River RV, Flagstaff. We also provide a great selection of used RVs for sale. If you need help finding the right recreational vehicle for you and your family, please contact us and one of our friendly sales staff will get you into an RV that fits your lifestyle. Not only do we specialize in RV Sales but we also specialize in RV parts, and RV service as well! Please take some time to look around our website! Questions? Stop by, call, or complete our on-line inquiry form.